UC San Diego’s Fashion Quarterly magazine offered two juxtaposing issues in their latest launch party. Fashion Quarterly is an ever-evolving fashion-centric publication fully managed and operated by UC San Diego students. To commemorate the release of their two latest issues, the members behind FQ hosted a launch party at The Loft. The event was both polished and celebratory, as groups of revelers surged into the dimly lit performance lounge and were greeted by the FQ personnel. 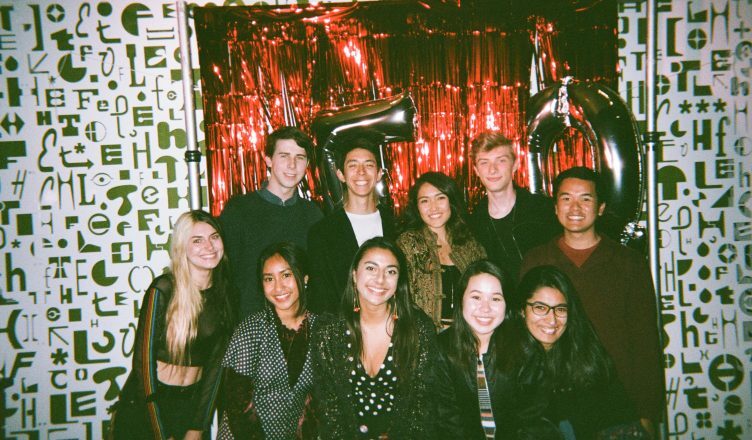 A live DJ set, a plethora of refreshments, and publicly available high-contrast disposable cameras that captured many of the ongoing activities propelled the celebration. The night began with a warm welcome from FQ magazine members offering goodie bags, filled with treats and accessories, to the attendees. The editors, designers, and writers of the magazine subsequently took the stage to share their visions and commentary on the creative process for the two issues. From there, the event transitioned into traditional celebration and socialization as the staff members exited the stage and began interacting with the attendees. The launch party ultimately culminated with a raffle for some Fashion Quarterly designed merchandise and copies of the recent publications. Yet, amidst the glitz and festivities, the issues themselves remained the focal point of the party, being laid out on a previewing table in the center of the room. Partygoers crowded around the zines and marveled at their compositions. To say that these two works are different from each other would be an understatement. Although the two publications were released in tandem with one another, a deeper insight into the magazines reveals that the design, literature, and thematic approach of Issue #15 and Issue #16 cover completely antithetical topics of the larger fashion world. Issue #15 tackles the human aspect of fashion. Rather than explicitly exploring aspects of designers or clothes, its main feature offers an exploration of the stigma around tattoos. The zine brims with vibrant and color-rich shots of both UCSD faculty and students displaying their body art for the camera. While the clothes supplement the color gradient and atmosphere of the image, they merely serve to draw attention to the faces and the stories behind them. The photos are also accompanied by a myriad of interviews and think pieces, all of which provide greater insight into the individuals covered within the magazine. On the contrary, Issue #16 firmly subverts the format and content of a conventional fashion magazine. It reverts to the most basic medium of costume, the clothes themselves. The smiling models, brands, and the glamour are all replaced with monochromatic close-up shots of just attire. While these photos emphasize the interaction of tactility, tailoring, and fabric patterns, they also place the garments firmly at the center of the magazine’s focus. Moreover, the overall design of the magazine seems to be more in line with an office catalog than a traditional fashion magazine, as articles are either printed on receipts or plastered over digitized and pixelated backgrounds. Fashion Quarterly’s two most recent issues are stellar, engaging, and expertly compiled works that explore two very polar avenues within the fashion realm. Their launch party aptly captured their months of hard work and was light, entertaining, and relaxed. Whether it be parties or magazines, FQ Magazine manages to create something simultaneously professional and exploratively creative. Image courtesy of Fashion Quarterly Magazine.